Rupert Pearce, CEO, Inmarsat. Credit: SpaceNews/Kate Patterson. WASHINGTON — Inmarsat CEO Rupert Pearce said Thursday the two purchase offers Inmarsat received from EchoStar this summer priced the company too low to take seriously. Despite signals of interest from satellite fleet operators EchoStar of Englewood, Colorado, and, briefly, Eutelsat of Paris, London-based Inmarsat does not consider itself on the market for others to buy, Pearce told investors. Pearce said Inmarsat put an end to EchoStar merger discussions, which took place in June and again in July, very early in order to assert the value of Inmarsat, whose revenues reached $717 million for the first half of the year, up 5 percent compared to 2017. Satellite telecom companies anticipate consolidation could still happen between operators in order to slow an oversupply of satellite capacity that is driving transponder lease prices down. Some analysts believe Inmarsat’s spectrum assets make the company a significant acquisition target as well. Pearce said Inmarsat is now beginning to actualize its growth plans with Global Xpress, its $1.6 billion four-satellite Ka-band network that was slowed by launch delays in 2014 and 2015. Global Xpress revenues reached $110 million for the first half of 2018, nearly doubling from the same time last year. Pearce said the pathway to $500 million in annual Global Xpress revenues by 2020 is now visible. “We remain highly confident in our strategy and prospects on a standalone basis,” he said. Bringing internet to aircraft is Inmarsat’s fastest growing business, increasing 38.8 percent to $115.5 million for the first six months of 2018. Pearce said more than 280 aircraft have Global Xpress antennas installed, and 50 have activated service. Inmarsat has more than 1,400 aircraft under contract for Global Xpress in-flight connectivity. The majority of Inmarsat’s revenue comes from maritime customers, followed by government users. Pearce said he is hopeful Inmarsat’s European Aviation Network, comprised of an S-band satellite payload and a terrestrial network of 300 towers spread across Europe, will start service in the fall. The primary holdup for service activation, which was originally anticipated last year, is the readiness of the network’s inaugural customer, International Airlines Group, Pearce said. 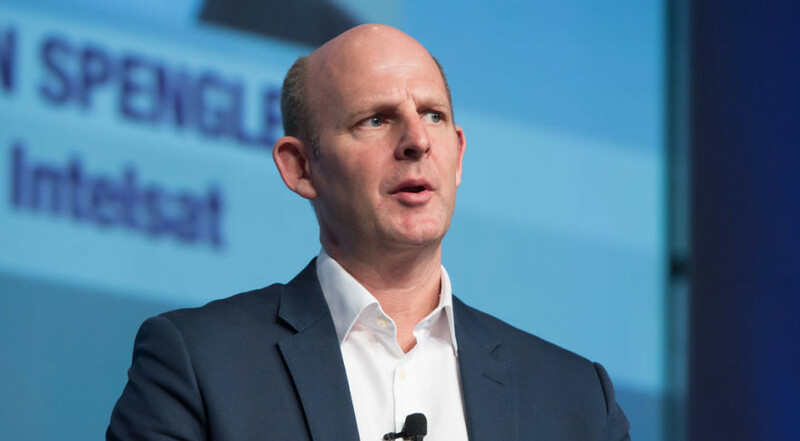 Pearce spoke broadly about Inmarsat’s next-generation satellite investments, saying future systems won’t look like the first Global Xpress system with a large upfront investment. Inmarsat’s focus now is on systems that can be built and implemented more quickly than traditional geostationary satellite programs. “Unless we break the model of $1.5 billion investments every few years, we won’t be able to respond to customer demand in the right way at the right time,” he said. In May, Pearce unveiled a program called “GX Flex” that would enhance the company’s L- and Ka-band satellite services, but gave few details beyond that it was in the Request for Information stage. Pearce declined to give a long-term forecast for spending, saying that a schedule laid out even for five years could be too rigid for the pace of technology development and market evolutions. “We are looking for levels of agility that allow us to deliver fully operational capabilities within two years from a decision to go live,” he said. Pearce pointed to GX-5, a Ka-band satellite Thales Alenia Space is building ahead of a 2019 Ariane 5 launch, as indicative of future investment thinking. GX-5 has 60 times the capacity and costs “well over $100 million less” than the first-generation Global Xpress satellites from Boeing, he said. “You can see the direction of travel and you can assume that that direction will continue,” he said. Inmarsat has two other satellites, the Inmarsat-6s, under construction by Airbus Defence and Space. Those Ka- and L-band spacecraft are set to launch in 2020 and 2021, with the first booked on a Japanese H-2A rocket from Mitsubishi Heavy Industries.